Lately the hubster and I have been into Greek and Mediterranean food. 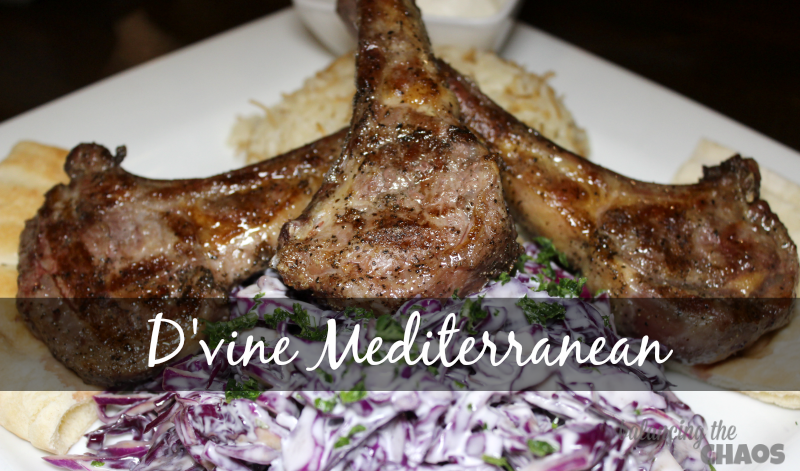 In fact, we've been craving Mediterranean cuisine for quite some time, so when we received an invite to sample D'Vine Mediterranean restaurant in Fullerton, we jumped on the opportunity. At D'Vine, we had the opportunity to indulge in the Mediterranean experience. Walid Alarja, the owner and resident chef, began cooking as a child apprentice, helping prepare meals in family restaurants and esteemed hotel in Bethlehem. Walid, a Master Chef, specializes in Mediterranean cuisine and is quite the host, as he entertained as well as prepared an amazing meal for us to sample. All of the dishes created by Master Chef Alarja were his original, home made recipes. We started off the evening with the D'Vine Mezza. This dish, which is great for a family of four or even a meal consisted of homemade Hummus, Baba Ghanoush (a seasoned grilled eggplant with tahini, yogurt and lemon juice), Mediterranean Salad (sliced cucumbers, bell peppers, tomatoes, onions, parsley, spices and olive oil), and Turshi (a combination of pickles, olives and turnips. I immediately started with the Mediterranean Salad and gradually made my way around the plate. My favorite item was the Baba Ghanoush with bits of pita. I think I'm the only person in my family who really likes cauliflower, but D'Vine's grilled cauliflower was fabulous and my family loved it. Master Chef Alarja takes cauliflower pieces and drizzled them with a little olive oil and seasonings. It's a MUST order. My children are rather finicky eaters, as I've shared before. Typically they'll select traditional favorites, so I wasn’t sure how they were going to take to Mediterranean style dishes. My son loves steak, so we felt the Kids Plate with steak skewers were a better fit for him. We were quite amazed when he devoured everything on his plate. He absolutely loved the filet medallions combined with D'Vine’s seasoned rice.